To my loyal followers and sometimes visitors, I wanted to let you know that I'll be taking a rather indefinite break from this tedious blogging. I am going to keep the blog up in case the spirit moves me to chime in with something here and there but I certainly wouldn't stop by here much, if i were you. I'll probably make some sort of decision in about six months as to whether to rekindle the blog or to put it up on the shelf permanently. Til then, G_d bless each of you. G_d bless America. G_d bless our troops. 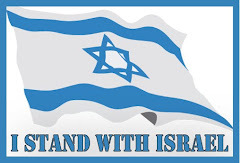 G_d bless the nation of Israel. 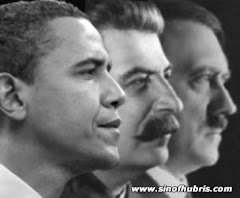 Have you ever wondered why in all of the years after the Vietnam War we never hear a PEEP out of Communist Vietnam? We never hear of their criticism of capitalistic America, we never hear of them threatening other countries with Marxist aggression. We never hear ANYTHING from them. Because it has been effectively passed down from Vietnamese leadership during the war to every generation since just how decimated the communist forces were at the hands of Uncle Sam. 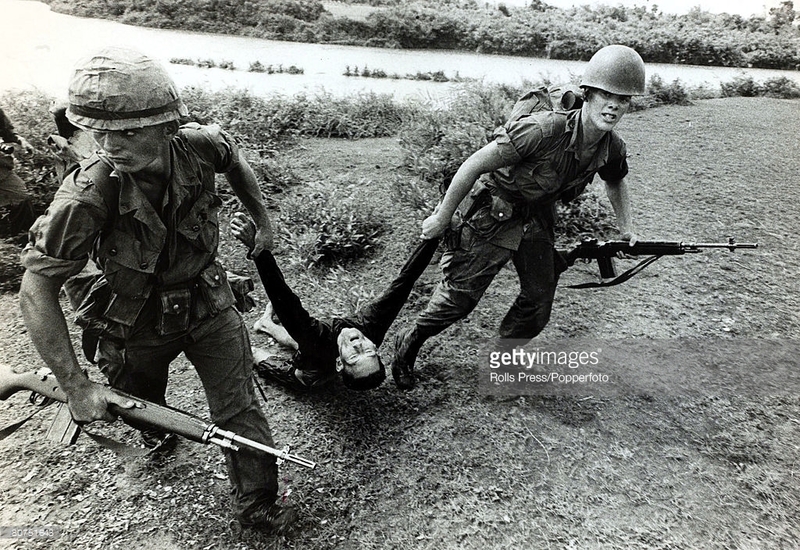 Everyone knows in Vietnam how entirely at the mercy of America the VC and North Vietnam regulars actually had been. They all remember how, if not for their rescue by the leftist media in America, they would have been wiped off the bloody map by American soldiers, Marines, airmen and sailors. That is why. And this is why. You will only get this kind of stuff from The Long War Journal. Ahmad Abousamra, a US citizen who graduated from the University of Massachusetts in Boston, became one of the Islamic State’s top propagandists and “chief editor” of its English-language magazine. His story is told in the the eighth edition of the Islamic State’s Rumiyah (“Rome”) magazine, which was released online in several languages earlier this week. He is identified as “Abu Sulayman ash-Shami” and “Shaykh Ahmad ‘Abdul-Badi’ Abu Samrah” in Rumiyah. The cover of the publication, seen above, features him. Abousamra was apparently killed in an airstrike near Tabqa, Syria in January. Press reports previously indicated that he was killed in mid-2015. But if Rumiyah is accurate, then he survived and continued to serve Abu Bakr al Baghdadi’s cause for nearly two more years. Before his demise, Abousamra rose to become one of the so-called caliphate’s most prolific English-speaking propagandists. And Abousamra was tasked with another especially important mission. He was one of the chief architects of the Islamic State’s anti-al Qaeda messaging. Abousamra’s family is originally from Syria, but he was born in France on Sept. 19, 1981. Rumiyah begins his story much later, with his graduation from UMass Boston, where he studied computer science. Their “plot was discovered just days before the operation’s appointed time,” according to Rumiyah. 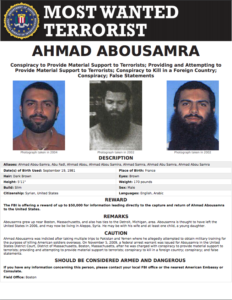 However, Allah supposedly “saved” Abousamra “from falling into captivity, allowing him to leave America before the FBI could gather sufficient information to release an order for his arrest at the borders and airports.” The FBI’s Most Wanted poster for Abousamra, offering a $50,000 reward for information leading to his capture, can be seen on the right. The FBI announced the reward on Dec. 18, 2013, years after Abousamra absconded from the US. Abousamra returned to “the birthplace of his fathers” in Syria, living in Aleppo for a “few years, seeking knowledge, calling his family and friends to tawhid [monotheism], and anticipating his next chance to wage jihad,” according to Rumiyah. The university-educated jihadist “was keen to avoid the eyes of the intelligence agency and avoid sitting with the evil scholars who were allied with the tawaghit,” meaning Bashar al Assad’s regime, during this time. Interestingly, Rumiyah avoids any mention of one of Abousamra’s earliest co-conspirators: Tarek Mehanna. Unlike Abousamra, Mehanna did not escape capture. Mehanna was arrested, tried and convicted on terror-related charges after joining Abousamra on a trip to Yemen in 2004. The pair unsuccessfully tried to join the jihad. After a week in Yemen, they were still unable to locate a training camp, so Mehanna returned to the US. Abousamra pressed on to Iraq and eventually elsewhere. Mehanna didn’t give up, however. He began translating and posting al Qaeda videos on the Internet. In 2012, he was sentenced to 17 and a half years in prison on terrorism-related charges. Federal authorities found that Mehanna lied about his own trip to Yemen and the activities of another one of his co-conspirators, Daniel Joseph Maldonado. 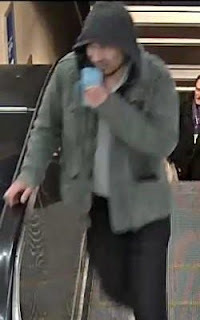 In 2007, Maldonado pleaded guilty to separate charges in a US Court, “admitting that he had traveled from Houston to Africa in November 2005 and then on to Somalia in December 2006 to join the Islamic Courts Union and elements of al Qaeda to fight against the Transitional Federal Government to establish an independent Islamic State in Somalia.” Maldonado was subsequently sentenced to a decade in prison. Rumiyah emphasizes that Abousamra knew Al Nusrah was initially comprised of Baghdadi’s “soldiers.” This is one of the key themes in Rumiyah’s story, because he would remain loyal to Baghdadi even after Al Nusrah broke away from the ISI and announced its direct allegiance to Ayman al Zawahiri, al Qaeda’s overall emir. Rumiyah portrays Abousamra as an unwavering Baghdadi loyalist who opposed Al Nusrah’s “treacherous” emir, Abu Muhammad al Julani. Until 2013, Julani was one of Baghdadi’s lieutenants. But he took Al Nusrah in another direction, disobeying an order from Baghdadi to fall in line. After Julani announced his direct allegiance to Zawahiri in Apr. 2013, the greatest rivalry in the history of modern jihadism broke out. Baghdadi’s enterprise mushroomed into the current Islamic State, challenging al Qaeda’s authority within the jihadist community everywhere from West Africa to Southeast Asia. Abousamra still sought to kill himself in a suicide bombing, but in the name of Baghdadi’s state, not Al Nusrah. The Islamic Sate finally picked a target, “a large group” of Bashar al Assad’s “supporters” in the “heart of the Nusayri regime-held areas inside the city of Aleppo.” He was going to “sneak into the middle of a gathering and detonate his explosive belt.” But Allah supposedly intervened once again. Abu Muhammad al Furqan, one of the Islamic State’s most senior leaders, discovered Abousamra and concluded that his talents were best put to use elsewhere. Another jihadist was sent to carry out the suicide bombing. “It was then decided to bring [Abousamra] to the Media Diwan of the Islamic State, which Shaykh Abu Muhammad was striving to enhance by widening its activities and supporting it with cadres of qualified scholars and technicians,” Rumiyah’s editors write. Under Furqan’s command in the media department, Abousamra organized the “foreign languages team,” which was created by Furqan “to inform Muslims in the east and west about the Islamic State and to urge them to perform hijrah to it.” Abousamra “worked on various videos” released by Al Hayat Media Center, one of the group’s main media arms, and translated materials into English. Eventually, these efforts evolved into the English-language Dabiq magazine. Dabiq is a town in Syria that has been at the center of the jihadists’ apocalyptic mythology. It is supposedly a key location where the jihadists’ enemies will be vanquished. 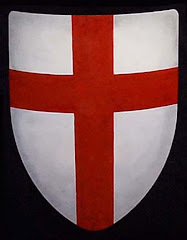 Furqan chose Dabiq as the publication’s name “in order to frustrate the Crusaders of Rome and convey to them their inevitable end – by Allah’s permission – just as Allah’s Messenger explained.” Every issue of Dabiq carried the words of Abu Musab al Zarqawi, the founder of al Qaeda in Iraq, which evolved into more than one jihadist group, including the Islamic State and Al Nusrah. “The spark has been lit here in Iraq, and its heat will continue to intensify – by Allah’s permission – until it burns the Crusader armies in Dabiq,” Zarqawi said. The group does not explain how it is going to conquer Rome, if it cannot even hold onto Dabiq. He wrote “many articles for the magazine, review[ed] what his fellow editors wrote, and scrutinize[d] any materials that were translated for publishing, spending a great deal of time and effort doing so,” Rumiyah’s editors explain. Abousamra worked closely with Furqan, who had “many responsibilities as a general caretaker of the Islamic State,” a role Furqan was appointed to by Baghdadi himself. Therefore, Furqan likely held one of the most senior positions in the Islamic State under Baghdadi. Because Furqan was busy with many matters, he relied on Abousamra for help “in drafting treatises and articles which would clarify the methodology of the Islamic State and expose its enemies.” Rumiyah’s editors claim that Furqan, who was killed in 2016, was impressed by the “quality” of Abousamra’s writing and his knowledge of sharia law. Writing under another alias, “Abu Maysarah ash-Shami,” Abousamra became one of al Qaeda’s most strident critics. That same issue of Dabiq included a lengthy article by Abousamra, writing under his pen name, “Abu Maysarah ash-Shami.” A screen shot of the piece can be seen on the right. Weeks earlier, in November 2014, Baghdadi announced the expansion of the Islamic State, declaring that the group’s wilayah (provinces) now existed in several countries outside of Iraq and Syria. Baghdadi also claimed that existing jihadist groups in these countries had been nullified, due to the presence of the caliphate. All Muslims owed their loyalty to the Islamic State’s wilayah, Baghdadi claimed. One of the affected nations was Yemen, where Baghdadi’s network has a branch to this day. Naturally, Al Qaeda in the Arabian Peninsula (AQAP), which rejected Baghdadi’s caliphate gambit, took exception to his declaration. After all, Baghdadi had implied, or even outright stated, that AQAP was no longer legitimate now that the caliphate operated on its turf. And in the sixth issue of Dabiq, Abousamra took it upon himself to blast Nadhari. Abousamra criticized Nadhari, “who is blinded by his spite,” for issuing a lengthy rebuttal to Baghdadi, adding that some of the AQAP man’s words “trickle with blood, forebode evil, and contain wickedness.” Abousamra claimed that Nadhari had fallen “into a bizarre contradiction” by emphasizing his continuing loyalty to Zawahiri. The Baghdadi loyalist argued that Zawahiri “doesn’t make takfir on the Rafidah [Shiites] to begin with,” as the al Qaeda emir excuses them “due to their ignorance.” Abousamra was referring to one of the key doctrinal differences between al Qaeda and the Islamic State, with the latter excommunicating all Shiites from Islam. Abousamra added that Zawahiri “does not make takfir of the supporters” of the regimes throughout region, “except for those officers who torture Muslims and belong to some specific departments of National Security.” In other words, al Qaeda’s emir is supposedly soft on the jihadists’ foes — an accusation never hurled at the Islamic State, which is known for its us vs. the world mentality. Abousamra believed he found a contradiction in Nadhari’s stance, as AQAP is warring with the Iranian-backed Houthis in Yemen and Zawahiri has forbidden the use of violence against Shiite civilians. But in reality, AQAP has attempted to put limits on its fighting. With some exceptions, AQAP confines its operations to predominately military and security targets manned by the Houthis and its other enemies. AQAP has also distanced itself from the Islamic State’s deliberate targeting of civilian areas. This is consistent with Zawahiri’s “General Guidelines for Waging Jihad,” a policy that was adopted by al Qaeda’s branches around the globe, but rejected by Baghdadi and his men, as they have fetishized attacks on Shiites. Still, once one goes down the jihadist path, the dividing line between permissible and impermissible violence can become murky. And Abousamra complained in Dabiq that AQAP “never” has a “problem cooperating” with groups such as the Islah party, an Islamist political group affiliated with the Muslim Brotherhood. A leading figure in Islah is Shaykh Abd-al-Majid al-Zindani, a longtime al Qaeda ally in Yemen. In his Nov. 2014 speech, Baghdadi took a swipe at AQAP, saying that if the Houthis had been confronted by real Muslims, then “their evil would not have become exacerbated.” (The Houthis began a largely successful offensive in Yemen months earlier.) Abousamra defended Baghdadi’s dig at his rivals, arguing that if AQAP hadn’t adhered to Zawahiri’s guidelines and engaged in “Zawahiri-style” fighting, which treats the Houthis “as a Muslim faction that is to be fought with the least amount of force required to repel its aggression,” then the Houthis would not have gone on the march. Only after the Houthis rose did Nadhari bless a broader war on their forces, Abousamra claimed, and by then it was too late. Abousamra also critiqued al Qaeda’s bay’ah (oath of allegiance) to the Taliban, noting that Mullah Omar’s group had called for and enjoyed good relations with nations such as Qatar and Iran. Such diplomacy is unthinkable from the Islamic State’s uncompromising perspective. As Baghdadi and his self-declared caliphate rose in prominence throughout 2014, al Qaeda marketed Mullah Omar as the true caliph. Osama bin Laden himself named Omar as the Muslims’ rightful ruler, al Qaeda reminded jihadists. There was just one problem: Omar was already dead at the time. And by late 2014, when the sixth issue of Dabiq was written, Abousamra seems to have heard that Omar was no longer among the living. The UMass grad explained that he had heard from others that “senior commanders in Afghanistan and Waziristan…doubt that Mullah Omar is still alive and are convinced that he was either killed or imprisoned, as none of them has seen him since the start of the modern crusader campaign against Afghanistan” in late 2001. He faulted the Taliban for issuing statements in Omar’s name with “clear deviation from the truth” in them, but recognized “it’s possible that these expressions…came from someone other than” Omar. Remember, the Swedes have embraced their Islamic refugees and immigrants. Everyone does group hugs every morning. After Obama, what came of the Iranian lobby in Washington? It appears the Iranians are missing their best friend in Washington, D.C. - Barack Hussein Obama. The role of the Iranian lobby in the US during the presidency of Barack Obama grew unprecedently. In the past, Obama has become a public intermediary between Tehran and Washington. He played a prominent role in the signing of the nuclear agreement between Tehran and the six largest countries until President Donald Trump’s arrival in Washington “when things went back to the starting point,” as proclaimed by Hooshang Amirahmadi, founder of the Iranian-American National Council of the pro-Tehran lobby in Washington. Amirahmadi, one of the most prominent figures in the Tehran lobby, said that Iran’s relations with the US had returned to zero after the arrival of Trump. The Iranian lobby, known as the “Nayak” in America, is currently led by Trita Parsi, an Iranian national with Swedish citizenship and residing in Washington. Iranian researcher Hassan Dai, one of the most prominent opponents of the pro-Tehran lobby in Washington, said that Parsi visited the White House during the presidency of Obama more than 33 times to transfer Iranian views to the US administration. The Iranian lobby in America, led by Parsi, is trying to convince US administrators and decision makers that the Islamic Republic’s regime must remain. The US is to settle with Iran on dividing the Middle East and safeguarding American interests, in addition to other goals including distorting the image of the Arab Gulf States in particular and the Arabs in general. “I do not know where Obama is now or even Kerry. America is not like Iran in politics. The official does not leave his office or return to it after 30 years. Obama and those around him were in power for eight years and today they are gone,” he said. The founder of the Iranian-American National Council revealed that Foreign Minister Mohammed Javad Zarif and Hassan Rouhani travelled to the US and met with first and second level figures in America but that time is gone. “Currently there is no one who can work for Tehran in the United States and no one is asking about Iran’s conditions in Washington,” he added. Every college age student in America who sides with the socialism model of their college professors should each be given a Che tee shirt to wear and a free flight for a one week stay in Venezuela. Then they can come back to America and lecture us old farts on the evils of capitalism. The story comes from Reuters. 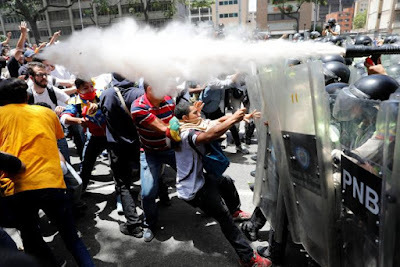 Venezuelan security forces quelled masked protesters with tear gas, water cannons and pepper spray in Caracas on Tuesday after blocking an opposition rally against socialist President Nicolas Maduro. The clashes began after authorities closed subway stations, set up checkpoints and cordoned off a square where opponents had planned their latest protest against autocratic government and a crippling economic crisis. In cat-and-mouse skirmishes on backstreets and highways around the capital, youths built barricades, burned trash and hurled rocks and bottles at soldiers and police. Various opposition leaders organized roadblocks. Police used pepper spray on National Assembly head Julio Borges, two-time presidential candidate Henrique Capriles and rights activist Lilian Tintori, as they led protesters onto highways and jostled at barricades, witnesses said. Opposition activists said armed pro-government gangs joined the fray and opened fire. "About 50-100 guys arrived on bike and started to shoot in the air," protester Bernardo Sanchez told local media, saying a bullet had lodged in his thigh. In one street, kneeling women sang the national anthem as neighbors banged pots and pans from nearby buildings in a show of anger against a government they blame for a deep recession that has led to shortages of food and basics. "We're going to get rid of them but we have to fight," said Jose Zapata, 57, an electrician, as he marched with a stick in his hand. Overlooking one wide avenue, some pro-Maduro residents in a state housing project threw trash onto protesters below. With thousands out on both sides, supporters of the 54-year-old president organized their own rally, in a volatile scenario seen constantly during the 18 years of leftist rule in the South American nation. "They want an intervention in Venezuela," said Prisons Ministry worker Juan Aponte, 34, who wore the red colors of the ruling Socialist Party. Protests also were staged in other cities and more are planned across the country for Thursday. The government accuses opposition parties of abetting a U.S.-led plot to topple Maduro, who has ruled Venezuela since the 2013 death of Hugo Chavez. Tensions have soared in the oil-producing country's long-running political standoff after the pro-Maduro Supreme Court last week annulled the opposition-led congress' functions. Although the court retracted that ruling over the weekend, the National Assembly remains powerless due to previous court judgments. The renewed instability sent Venezuelan bonds lower, with the benchmark 2027 paper's price down 4.4 percent. Foreign pressure on Maduro has risen as opposition protests resumed late last week. "Here the world can see the dictatorial path Mr. Maduro has chosen," Capriles said. Maduro says the U.S. government and other foes are whipping up hysteria against him to lay the ground for a coup. "From the north (the United States), they give the order to the defeated fascist right of Venezuela to fill the streets with violence and blood," Maduro said on state TV. "In Caracas, in Venezuela, peace has triumphed once again." Maduro's administration is particularly furious with Organization of American States head Luis Almagro, who is leading regional condemnation. The regional bloc on Monday urged Venezuela to restore congress' authority and guarantee separation of powers, but Venezuela's representative walked out, as did the envoy from fellow leftist Bolivia, which holds the OAS presidency. "The OAS has surpassed itself in aggression against Venezuela," Maduro said late on Monday. "It is a real court of inquisition, carrying out abuses and vulgarities." Venezuela's opposition won a National Assembly majority in late 2015 but the Supreme Court has overturned almost all its measures. Due to the chaos in Caracas, the legislature postponed until Wednesday a session to censure the "rupture" of Venezuela's constitution. Legislators also plan this week to start proceedings to remove Supreme Court judges but that would only be a symbolic rebuke since congress has no power to act. For anyone that might have missed it - this is the video of the body of the Blind (motherfucking) Sheik arriving back to his native Egypt. You know, we never did settle that score in Somalia, in my view. 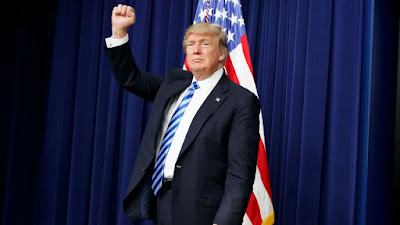 The US military has been granted approval by President Donald Trump to target Shabaab, al Qaeda’s branch in East Africa, with “additional precision fires.” This now makes Somalia part of what the Obama administration had described as “areas of active hostilities,” where jihadist groups like al Qaeda, the Islamic State and other terrorist groups can be directly targeted by the US military with looser restrictions on the use of force. “The president has approved a Department of Defense proposal to provide additional precision fires in support of African Union Mission in Somalia (AMISOM) and Somali security forces operations to defeat Shabaab in Somalia,” Pentagon Spokesman Captain Jeff Davis said in a statement released by the Department of Defense. “This authority is consistent with our approach of developing capable Somali security forces and supporting regional partners in their efforts to combat Shabaab. Somali and AMISOM forces have already achieved significant success in recapturing territory from Shabaab, and additional US support will help them increase pressure on Shabaab and reduce the risk to our partner forces when they conduct operations,” Davis continued. Under the Obama administration, areas of active hostilities included Afghanistan, Iraq and Syria, and in Libya for a brief period of time in 2016 when the military was directly supporting the offensive against the Islamic State in Sirte. 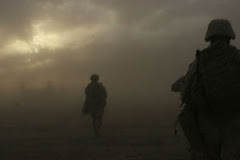 In these areas, the US military was directly engaged in the fight against the jihadist group and can operate under looser restrictions in targeting the terrorist insurgent groups. In the areas outside of active hostilities, which included countries such as Yemen, Somalia, and Libya, and though not stated by the US government, Pakistan, the US military was forced to operate under strict rules of engagement that insisted that any operation targeting terrorists include the standard of near-certainty of no civilian casualties. The strict rules of engagement has allowed jihadist groups to thrive and expand their insurgencies against weak central governments. Can the world get any more fucked up? WASHINGTON: As a US lawmaker on Thursday described Russia as a revisionist power, a top American general warned that Moscow may be providing weapons and other support to the Taliban in Afghanistan. “In my view, Russia is a revisionist power that will cause further trouble across Europe and in the international order more generally,” Senator Ben Cardin, a ranking member of the Senate Foreign Relations Committee, said at a congressional hearing in Washington. “Russia sought to undermine and interfere in our election, and how we respond to (President) Putin’s broader strategic game is one of the key challenges of our time,” he added. At another Capitol Hill hearing, Gen Joselg L Votel, Commander of the US Central Command (CENTCOM), told members of the House Armed Services Committee that Russia was trying to revive its influence in Afghanistan. Gen Votel also confirmed that the Trump administration was doing a complete review of the US policy on Afghanistan, which explains why there have been more than a dozen congressional hearings and think-tank debates in Washington this month on the situation in Afghanistan and Pakistan. At the Senate hearing — “The Road Ahead: US Interests, Values and the American people” — Senator Cardin said that the end of the Cold War was not the end of Russia’s influence, which reminded the American people of its presence by interfering in the 2016 US elections. “Russia has attacked our democracy, illegally annexed Crimea and invaded eastern Ukraine. Putin’s Russia now considers itself in an existential struggle with the West,” he warned. At the House panel, Congressman Rodney Davis, an Illinois Republican, asked Gen. Votel: “What kinds of support are the Russians sending to the Taliban? And how direct is their involvement? What does that mean about our ongoing conflict there? “It’s fair to assume they may be providing some kind of support to them in terms of weapons or other things that may be there. Again, I think that is the possibility. I believe what Russia is attempting to do is they are attempting to be an influential party in this part of the world,” said the general, who as CENTCOM chief looks after the greater Middle East region, including Afghanistan and Pakistan. Gen. Votel, however, acknowledged that the Russians also had some concerns about Afghanistan because it’s close to former Soviet states that they consider to be within their sphere. “But in general, I don’t consider their outreach and linkage to the Taliban to be helpful to what we have been … trying to accomplish for some time now in Afghanistan,” he said. Congressman Brad Wenstrup, a Republican from Ohio, asked how the growing Russian influence in Afghanistan could affect the US policy for that region. @TellMamaUK The Yanks are coming. The Yanks are coming. 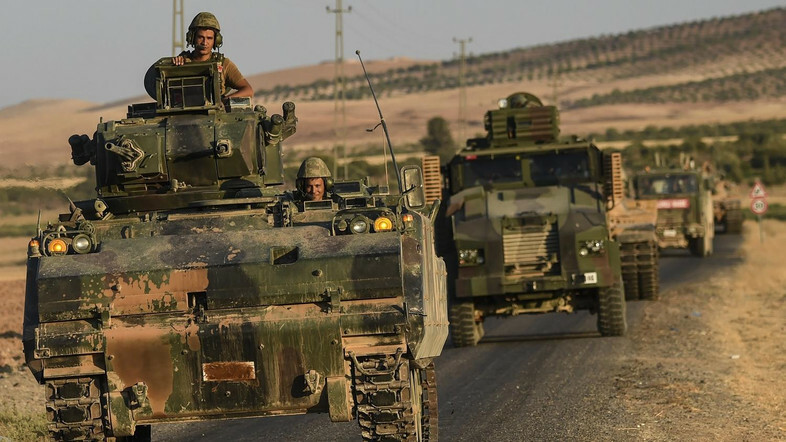 The Turkish army said Friday it will keep a military presence in Syria despite officially ending its offensive in the country’s north against the ISIS militants. “Our activities continue for the protection of our national security, to prevent any undesirable entity, to allow our displaced Syrian brothers and sisters to return to their country, and to ensure security and stability in the region,” the military said. The completion of the operation dubbed “Euphrates Shield” had been announced by Prime Minister Binali Yildirim on Wednesday, who nevertheless did not rule out new military campaigns inside Syria. At the time, neither Yildirim nor the top advisory national security council had said whether or not there were plans to withdraw Turkish troops. Turkey launched in August its unilateral operation with Syrian rebels to remove ISIS from its border and to halt the Kurdish militia advance. Dozens of Turkish soldiers were killed by ISIS during clashes and attacks as Turkey-backed Syrian opposition fighters recaptured towns including Jarabulus, Al-Rai, Dabiq and Al-Bab. President Recep Tayyip Erdogan’s spokesman Ibrahim Kalin said Friday the completion of the military operation did not mean Turkey would ignore what takes place on its southern border. “There should be no meaning taken from this that Turkey will remain indifferent to the security risks or will not engage there,” Kalin told reporters in Ankara. “Just the opposite actually, security measures in the region continue at the highest level,” he added, without giving further details. Turkey has suggested it wants to join any operation to capture ISIS stronghold Raqa, but without the Kurdish militia it views as terrorists. Turkey appears to be sidelined as US-backed Syrian Democratic Forces including Kurdish fighters are laying the groundwork for an assault on the heart of the militants’ so-called caliphate. US Secretary of State Rex Tillerson would give no comment on Turkish involvement during his visit to Ankara on Thursday.